Sent to Christchurch City Council 15 sec later. 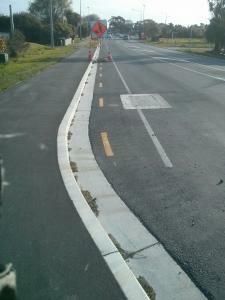 Before recent repair work there was a drop kerb for cyclists heading southbound over Wainoni Bridge joining the dedicated cycle path over the bridge with the cycle lane on the carriageway. During recent repaving work around the bridge this drop kerb was not reinstated and there is now no safe way to join the cycle lane on the road. Cyclists are forced to ride a further 100m on the pedestrian footpath before the next drop kerb.